Brand Licensing Europe has announced six finalists for this year’s License This! competition following a record number of entries and an intense judging day last Friday in London. For the first time in the competition’s 10-year history, there are two award categories: Character & Animation and Brand & Design. The final will take place in the Brands & Lifestyle Theatre at Brand Licensing Europe at 12:30pm on Thursday 11 October and everyone is welcome to attend. Gail Grisham is a vintage doll that posts regularly on social media about family life. Her unique observational comedy truths are relatable, particularly to mothers, and are laugh out loud funny. Oddcats is a pre-school property from Zara Picken; a mob of mischievous creatures with a taste for adventure and socks! Cute, colourful, a little bit quirky and with a distinct stitch design, the Oddcats borrow odd socks to help them along on their globetrotting travels. Hailing from Argentina, the Real Monster Show is a world full of colourful monsters targeting 6-11 year olds with an anti-bullying and diversity message and the potential to become an animated TV series and much more. Animals from Sarah Burman is a range of colourful, characterful quirky animal designs with a unique patchwork texture, strong colours and a hint of retro. Adorable blue smudges that came into the world by accident, Blubz are funny, heartwarming blobs of fun illustrating great copy from Drew Bristow. Vintage inspired imagery with a contemporary twist, timeless and unattached to temporary trends, Pabuku’s designs are high end and refreshingly unique. This year’s two License This! 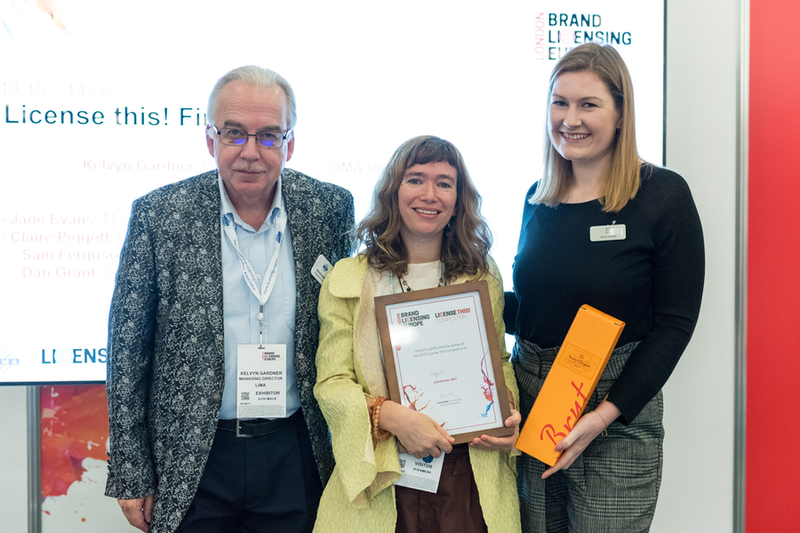 winners will receive a free exhibition stand at Brand Licensing Europe 2019, one year’s LIMA membership, PR support and advice from a panel of industry experts. For the first time, all finalists will receive legal consultation from competition sponsor Wynn-Jones. Previous entrants – both winners and finalists – have also signed lucrative agent and licensing deals off the back of the competition. “This year, we had the most entries we’ve ever had for License This!, which is testament to the growing appeal and importance of the competition. Such is the depth and breadth of entries we have received over the years, this year we have introduced two award categories,” said LIMA UK managing director and License This! chair Kelvyn Gardner. Brand Licensing Europe brand manager Laura Freedman-Dagg added: “The ethos behind License This! is to support the growth of the licensing industry by attracting, supporting and engaging new blood as well as promoting it as a potentially lucrative sector to do business in. Brand Licensing Europe is the definitive event for the licensing industry in Europe, taking place 9-11 October 2018 at Olympia London. Over 7,500 retailers, licensees and marketers are expected to attend, over one third of whom will travel to London from overseas.